Flat tyres on bikes are so infrequently that it’s pretty common for riders not to have a puncture repair kit on them. If you find yourself in that position, what can you do? Well, if you follow this easy to understand guide, you’ll be okay. All you’ll need to complete this task is the strap from your sunglasses and some leaves or grass. Okay, before we get all Bear Grylls on you and tell you how to survive in the wild when your bike’s broken down, make sure understand a little bit about how the tyre works. The tyre is made up of little more than an inner tube that’s inflated and runs along the inside of the rubber carcass that connects to the road. The tyre connects to the rim with the inner tube within it. 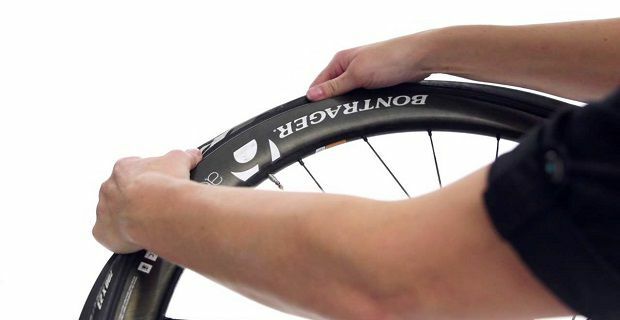 When you get a puncture, it’s the inner tube that’s damaged so that’s the part that will need replacing. So, we’re assuming that you don’t have a replacement inner tube and you don’t have any tools, with what we’re going to tell you about you won’t need anything. All you do to provide a temporary solution on the side of the road is to dismount your bike. Now turn it upside down. You’ll need to use your hands to claw the rubber from the rim in order to get to the inner tube. When you do that, check the inner tube to locate the leak. When you know where the leak is, use the string from your sunglasses as a tourniquet to stop any more air from leaking out. This will leave you with a badly deflated tyre. To remedy this, and in order to get yourself home, stuff dried leaves and grass into the tyre and then push the inner tube back in. Now connect the tyre and the rim and then the rim to the bike. When you cycle away, do so slowly and replace the tyre as soon as you can in order to limit any possible damage to the rim.